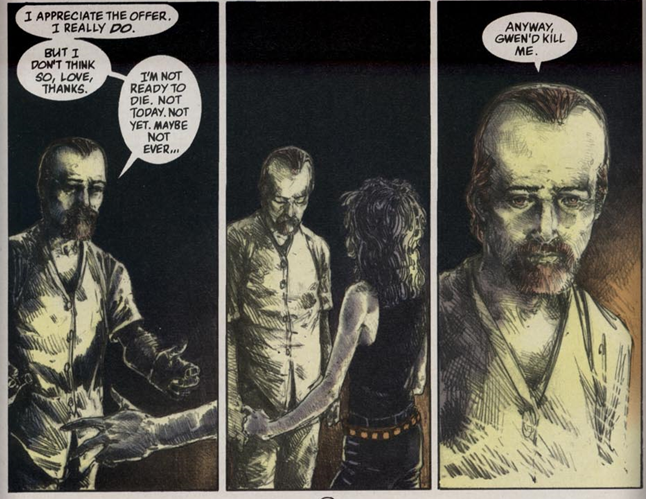 Reading through both Watchmen and the Sandman series, I noticed a peculiar fact. The characters that are essentially immortal for the most part seem to have horrible love lives. Is it because of their powers and responsibilities, or is it something else? I’m going to focus on four characters between these two series. First off, there’s Element Girl, a minor DC superheroine. She originally worked for the CIA, being transformed by Ra to be able to control the elements. Eventually though, since a covert organization does not require a flashy character as herself, and due to neglect from writers, she gets retired and stuck on a pension. Apprehinsive of her appearance, she isolates herself from most physical contact, and since the internet hasn’t been invented in her time, she despairs over no contact. Interestingly enough, she desperately holds on to her humanity and doesn’t turn into a villain. Obviously with no social interaction, no sort of romance can arise. Eventually she finds a way to die happily, though a method that would cause most of us normal people to go blind. Since we don’t get too much about her, only a chapter, I can’t say too much about her. I’m blue da ba di da ba dai. 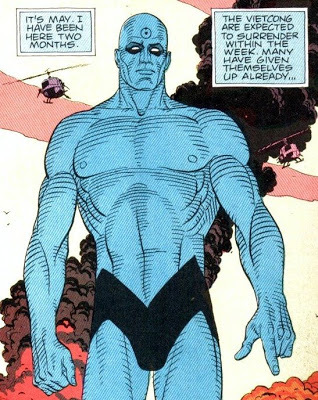 Next up is Dr. Manhattan, the big blue being with phenominal cosmic power. Now he originally came back from being vaporized to get back to his lover, but soon afterwards grew bored with her and decided to screw around with the second Silk Spectre, Laurie Juspeczyk. Eventually he gets bored with humanity as a whole though, and he decides to leave the planet. After rekindling his interest in people throughout the events of the story, he goes off to make his own universe to see their own reactions. The biggest obstacle for him to have romance is the non-linear way that he sees time. Apparently that messes with his percieved ability to make choices, as he already sees what he will do and how he will react. I could go on a rant on why I don’t like him, but I’ll shut up on that topic. But for his love life, it seems to be honest and real when he was still a normal guy, but when he becomes the blue guy, he seems to be more like an echo or a shadow of his former self. Then shifting back to the Sandman comics, we come to Dream. His love life has pretty much been a series of tragedies, one after another. The first person he romanced was named Killala of the Glow. While he loved her very much, she was manipulated by Desire into doubting her relationship with Dream, and so fled from him. This ended up changing Dream into the somber figure of the narratives, as well as breaking up any sort of relationship he had with Desire. The second person was an African queen named Nada. Apparently Dream wasn’t allowed to have her, a mortal, as a lover, and when he did so, the sun wrecked her civilization. She then killed herself instead of accepting Dream’s offer to become his queen, and in his anger, he stuck her in hell for a long time. The only reason why he eventually decided to save her was because Desire provoked him, and Death yelled at him for being so stupid. I don’t know why, but he next decided to do a long-distance relationship with the muse Calliope. Eventually they had a son named Orpheus. Unfortunately, due to the way he apparently treated his son, Calliope left him. Later on, she gets captured by Erasmus and handed over to Richard Murdoc, both of whom abused her powers of inspiration and her body. At that point, desperate enough she calls for help from Dream, who helps her get free. She tries to rekindle their relationship, but Dream decided that doing so would not be a good idea. He does this when moping a lot. I’m not entirely sure, but there seems to be some sort of relationship to Titania, the queen of the fae. But obviously, it didn’t end well, since they aren’t together, and the Midsummer Night’s Dream seems like some sort of apology to her by Dream. The last of his lovers is a witch named Thessaly. Like a fire, he passionately courts her, but that quickly gets extinguished when he gets back to his work. Like Nuala later on, he makes no effort to stop her from leaving, which makes Thessaly mad and Nuala depressed. I think the one large flaw of Dream’s is that he seems too worried about his responsibilities as lord of dreams to be able to have a steady relationship. It is further cemented by the fact that his brother Destruction abandoned his responsibliites, and Dream doesn’t want to do anything similar to that. And throughout the series he never really actively makes a choice. Rather, he is either guilt tripped into saving a character, or saves someone due to a promise he had previously made. Now the odd one out of these characters would definitely be one of Dream’s only friends, Hob Gadling. They first met at a bar, where he was drunkenly ranting on how to not die. Dream being amused, asks Death to leave him alone, and makes a deal with him to meet at that place in every hundred years, and repeats the offer of dying at each of their meetings. Now no matter what happens, he still chooses to live. He has several lovers as well, but from what I can tell, he remained faithful to each and every one of them until their deaths. Even the last time we see him, he refuses Death’s offer even after being depressed over Dream’s own demise because of his current love. It seems that the powers are what makes each of the first three characters miserable. It’s not just responsibility, since Manhattan never really had any after becoming nigh-omnipotent, and Element Girl stopped being useful to the CIA. It’s not being born with the powers, as Element Girl, Manhattan, and Gadling all were granted such abilities. It’s not appearance, since Dream can appear in any form he wishes to. So it really seems to me that their powers, aside from immortality is what causes them to lack a love life. Element Girl sees her powers as an abomination, Manhattan as a reason to be disconnected to others, and Dream as a responsibility to devote his attention to, at the cost of his relationships. Hob’s optimism is pretty much the biggest counterpoint to all the others. Living forever is awesome. Especially living for loved ones. ← Do you know about Craig Thompson? While I get the general idea of what you’re saying, I don’t think the presence of powers solely accounts for each character’s solitude. Of the characters you listed, Dr. Manhattan and Dream have one distinguishing feature; both are beyond humanity. It isn’t Dr. Manhattan’s powers which separate him from humanity, it’s his view of time and space. He’s everywhere all the time, experiencing things all the time. Furthermore, we don’t really know why he came back from his disassembly. Could it have been love? Maybe, but it was probably just a reaction to him seeing himself with his girlfriend(s), then in Vietnam, then on the Moon, and etc. As for Dream, his solitude seems to derive from a combination of his responsibilities and attitude. I mean, his first relationship went south because his girlfriend cheated on him, which likely led to some serious trust issues. He isn’t very nice to Nada or Calliope either, which suggests that either his arrogance or coldness are to blame as well. I will agree that Dream’s responsibilities strain his relationship, but I wouldn’t relate that to either his power or being long-lived. Humans like Element Girl and Hob Gadling are different. Element Girl simply can’t accept what she is, and is paranoid about how others view her. Being immortal really doesn’t affect her love life, it just happens to be in the mix. As for Hob…he won the jackpot, existentially speaking. He has no duties, no discernible powers other than immortality, and presumably no major emotional or mental issues. What’s more, he can find happiness anywhere, and without Death he can explore certain avenues of freedom which mortals can’t. I’m not saying immortality can’t put a damper on one’s love life. It might under the wrong circumstances, but in these cases immortality is usually part of a package deal. Can vanilla immortals live unloved? Yeah, but if they do it’s probably because they decide to love one person, that person dies, and they decide they can’t go on. Really, the role of immortality is all about perspective.